Let’s be honest, breastfeeding can be downright exhausting. Getting up to feed a baby in the middle of the night is just part of the fun of being a mommy. It comes with the territory and nothing adds to exhaustion like getting up multiple times a night and dragging yourself half-asleep clear across the house to your baby’s room. Especially if you are a working mom having to get up early. If you are like me, then by the time you fall asleep, your baby is awake and ready to eat again (insert exhausted sign, here). Co-sleeping is a great solution to this problem. It basically means that you sleep your baby in your room with you. Co-sleeping is often thought to mean that your baby is sleeping in the same bed but that is not true. 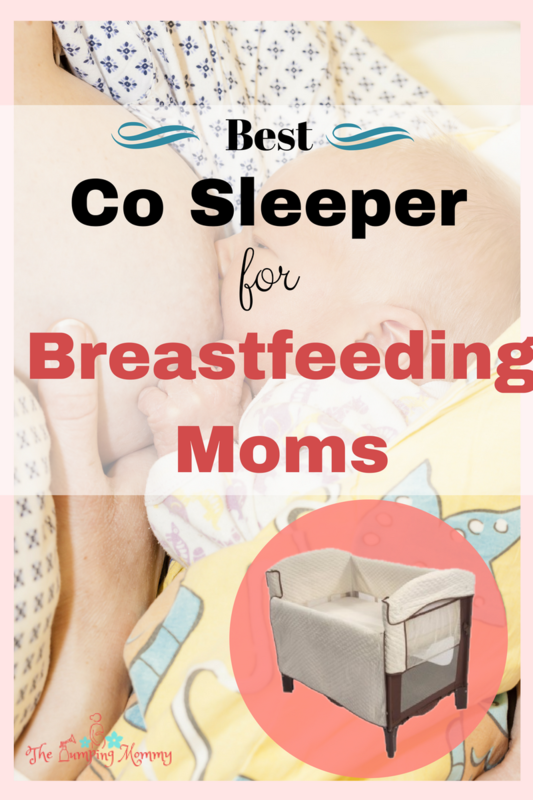 Co-sleeping is actually defined as having your baby in the same room and is a great way to keep your milk supply up by having your baby close. 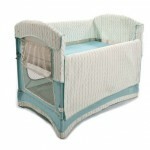 There are many bassinets, Pack In Plays, rockers, etc on the market today that can be used as a safe sleeping cot for your baby but they all require you to physically get up to reach your baby. Arms Reach Co-Sleeper helps eliminate that issue. The idea of the Arms Reach Co-Sleeper is to literally keep your baby at arms reach. 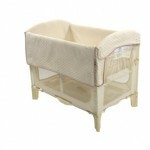 It can be used as a standard bassinet or be attached to your bed as a co-sleeper. 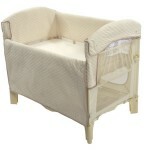 This is the feature that makes this bassinet stand out to me. Bed sharing was always miserable for me. I never slept well because I was hyper-aware of my baby and somehow I would end up contorted in some weird position. Nothing shrinks a bed like a tiny baby. They take up about 90% of the bed space. So having the option of bed sharing without my baby actually being in my bed is a win, win in my book! Need a good nursing bra or tank for nighttime feedings? Click here to read about my favorite! Arms Reach makes a few different styles of co-sleepers. 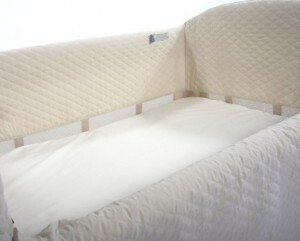 There is the Arms Reach Ideal Co-Sleeper and the Mini Arc (which has three styles). I am talking about the Arms Reach Ideal in this review which is bigger. The Arms Reach Ideal features more ventilation for even better breathability, side pockets for storage, a 4-inch sleeping nest (height), and patented attachment strap and plate to provide the safest sleep solution for you and your baby. 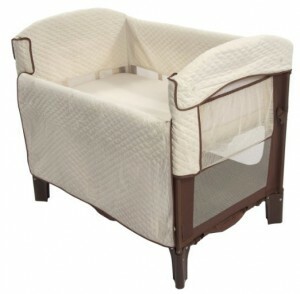 The bedside co-sleeper and bassinet modes can only be used up until 5 months of age or when baby your baby can push up on their hands and knees (whichever comes first). 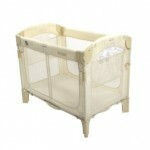 But the option to convert to a playard makes this a portable and useful item that you can use for quite some time. The Arms Reach is for bed heights starting at 24″ (Measured from the floor to the top of the adult mattress). If your bed is greater than 24″ tall, a Leg Extension kit can be purchased. One of the great things about this style of the Arms Reach Co-Sleeper is that there are 5 colors to choose from. If you have a specific nursery theme or just don’t want your baby items to clash with your room decor (hey, it happens) then there is likely a color perfect for you. I personally am a sucker for the Chevron. Works wonderfully for a girl or a boy! I do like that they offer so many different options. Everyone has a different taste and style so the multiple colors are a big plus in my book. The Arms Reach Co-Sleeper is a great product. I had a Greco Pack N Play with my first baby and the bassinet is quite flimsy. Even as a newborn it seemed to dip to one size because of how it is suspended. I like that the Arms Reach is one piece and is more sturdy. I think it can hold a baby for quite a bit longer than a Pack N Play. The dimensions of a Pack N Play and the Arms Reach are similar. The Pack N Play is slightly wider. With that said, regular Pack N Play sheets are not a good fit for the Arms Reach so you need to ensure you purchase some extra sheets made for it. Overall, if you want a great co-sleeper that is versatile and that you won’t stop using after the newborn stage, then this is a great option. 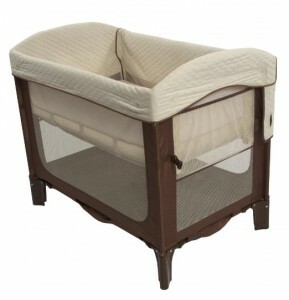 It is comparable and even cheaper than some of the Pack N Play units on the market. I say save your sanity at night and keep your baby close! The Arms Reach is a great product to help you do just that! Click here to read more about the Arms Reach Co-Sleeper! 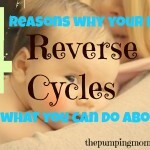 Reverse Cycling: Find out why your baby nurses more at night and what you can do about it! 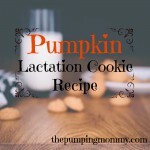 Lactation Cookie Recipe – Try this yummy and milk making recipe! Best Nursing Bras? Try Cake Lingerie and never look back!